Support BROOD with our Amazon link. My name is Howie and I am a young basset mix with lots of puppy in me and a high energy level. I am friendly and playful with other dogs and like going to the dog park for the social scene. I am also friendly with people that I meet along the way. I know how to use the dog door and am crate trained. More importantly I have made great progress on my house training too. I am looking for an active home and owner who can give me lots of exercise and work with me on my manners. A basic puppy training class would be great for me. I am always on the go and looking for the next fun thing to do! You can call me a love bug who wants love and attention. My foster mom says I am a little goofy - but that's me. I may not be big in size, but I like to live large. Our fabulous Spring Online Auction is now up and ready for bidding on over 100 great items. Be sure to register as a bidder in our new auction system as your former log-in is no longer active for BROOD online auctions. The auction runs through April 22. Voting is now open for our fabulous 2020 Calendar Contest! This year there are 121 photos all vying for your support. Voting continues through the end of June. Purchase Honeybaked Ham Gift Cards through the end of April. BROOD will get a 20% donation from every purchase. Buy gift cards for yourself or for family and friends. It's time to join or renew your BROOD Membership for 2019. 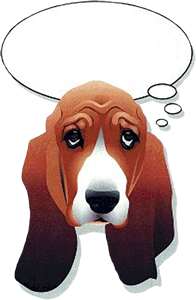 Membership gives you a say in rescue, and you will also receive our emailed BROOD Newsletter featuring useful articles about basset health, behavior and care. Attention all you hounds (and wanna be hounds)!! You can join BROOD just like your human, and your name will be featured on the BROOD website too! Become a BROOD Ambassador for 2019 and help us find homes for dogs just like you. Have you adopted a BROOD dog? And are you a paid-up Member of BROOD? If so, you can now have your BROOD dog featured on our website for FREE! Check our Faces of BROOD page for details and to submit your photo.